J.J. L’Heureux’s ‘Lazzaroni,’ print with knotted threads in an edition of 40. Right: Julienne Johnson’s ‘La Suite Jany 2013’. Tonight, Aug. 1, Los Angeles artists Julienne Johnson and J.J. L’Heureux will take part in an opening reception for a new group show titled “Five Artist Show” at FABstudio in Santa Monica. Both artists have exhibited their work around the world, but admit they are looking forward to being featured in this Main Street gallery. In January 2014, Julienne Johnson attracted the attention of the museum, Spedale degli Innocente, in Florence, Italy. After being hosted by the museum for nine days, she was invited to propose a site specific, solo exhibition with the re-creation of her “Touched” series. The museum’s interest was piqued by her documentation of the same – a video (2014) and book (2013) with an Introduction by Peter Frank, internationally renowned art critic. While visiting Florence, she lectured at the Accademia D’Arte and the American University. She was invited by curator Lydia Takashita in March 2014 to participate in a Thailand/USA exhibition. Her first Japanese shows are scheduled for 2015 at the Fukuoka Museum in Kyushu Island and in Kyoto. Her next Thailand exhibition will take place in 2016. J.J. L’Heureux has shown her work around the globe. Best known for her nature photography, she has embarked on over 13 expeditions to Antarctica and has just returned from another photography trip to Alaska. 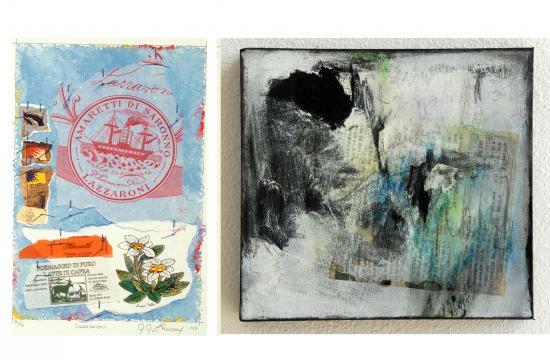 She is also a painter and creates works using mixed media and collage. L’Heureux used the name “Etichette” for her collage series, which is the Italian translation for wrapper/label. The reaction she received from this new series was unexpected, so she continued to create them. The series has grown to become quite popular among her collectors. The artist splits her time between collage work, photography, and painting. Her “Bergy Bit” series of paintings was inspired by her expeditions to Antarctica and her “Faces from the Southern Ocean” photography series (jjlheureux.com, penguinspirit.com). Tonight, Aug. 1, enjoy a public reception for “Five Artist Show” from 7-9:30 pm at FABstudio, (2001 Main Street, Santa Monica 90405). The exhibit will remain on view through Sept. 25.